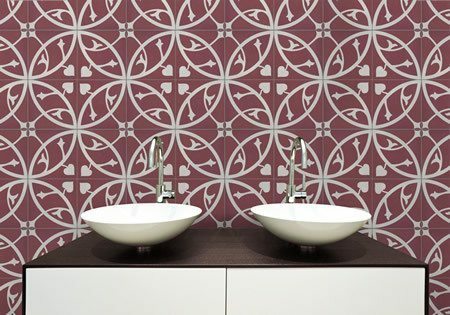 Thinking about renovating a bathroom here are some of the best bathroom tiles looks in 2015. If your bathroom feels a bit outdated, a good place to start a remodeling project is by re-imagining the look of your bathroom tile. A new tile look can completely refresh a space, and 2015 has brought with it some attractive new home tile design concepts that are perfect for giving new life to boring bathrooms, giving them the dramatic effect of a full remodel without the expense of a more extensive project. Learn how to tile a bathroom floor with these beauties too. Made from a variety of small stones embedded in a mesh backing, pebble tiles add welcome character to a stale bathroom aesthetic. The blend of hues and textures makes for an eye-catching look, and the individual squares are laid and grouted just like conventional tiles. Pebble tiles are ideal for water rooms such as showers and pool decks, and the stones can be selected in neutral colors, earth tones and even vibrant fashion colors to give you plenty of options on customizing your bathroom design. Mosaic tiles combine tiny pieces of colored glass into a lively traditional or abstract motif which is then placed onto a tile. The shapes of the glass pieces can be square, rectangular or even hexagonal, and the patterns these colorful shapes create can turn a lackluster bathroom into a showcase of your personal style. The stately stone tile has experienced a recent revival as technology has worked to minimize the imperfections of this classic tile material. Many modern stone tiles are manmade and designed to be much tougher than their natural counterparts, which presented a beautiful look but was extremely susceptible to cracking over time. Stone tiles give a bathroom a cool, natural look, and improvements to its design make it an even stronger choice for a stylish bathroom remodel. White tile gives a bathroom area a bright, clean look, but can be bland on its own. Wood accents provide the warmth and texture that give the space visual appeal, and the classic combination often used in spa decor has become one of the hottest trends in home bathroom design. Wooden flooring or wall paneling can add a striking contrast to an otherwise bland bathroom, and the effect is sleek yet very inviting. Lighted tiles are the latest trend in bathroom design, and can give your décor a futuristic yet practical touch. Lighted tiles place LED lights inside a durable ceramic tile, and can be left to glow full time or wired to a switch or light sensor for nighttime navigation. Lighted tiles are commonly rated for about 100,000 hours of active time, so the amazing effect will brighten evenings for years to come. Where bathrooms were once a space designed purely for utility, home décor trends have made them into feature spaces for statements of style. If you’re looking for a way to refresh the look of your bathroom or start a full remodeling project to fully redo the space, a new tile scheme is an outstanding ground floor. Here are some more articles to help with your remodel. How to install Hardwood Flooring & How to tile a tile Shower . Which of these best bathroom tile looks do you prefer? I’d love to redo my bathroom. The pattern that is second is so nice! The tile patterns are gorgeous and would really enhance a space. I’d love to fancy up my bath that way. 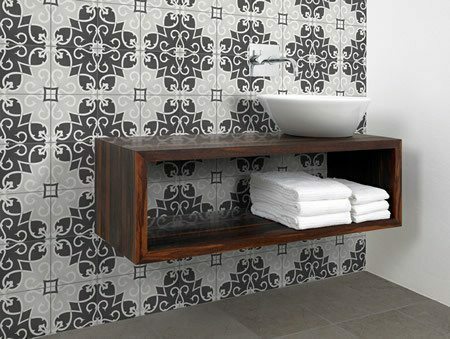 Stone tiles certainly sound very cool and different! I really want to re-do our downstairs powder room. I love how your post some great ideas. This Spring we are giving our main bath a face lift. The tiles are really pretty – not sure what tile we will use. those look so good. I want to start redoing my trailer a little at a time. I love the gray tiles! I would never have thought I’d like patterned tiles but those are really pretty! I love the first picture. It is really bod with the pattern and color, but I think it works. I’ve always like the look of glass tiles, especially with a mosaic pattern. The concept of lighted tiles is really cool too! I like the second photo! Such a great way to accent a bathroom. I love the tile in the first photo. The design and color are both stunning! I wish I could redo my bathroom, It’s so small and it was WALLPAPER. UGH, and NO storage. I love some of those tile looks.